This page contains everything you need to know about the strategy, tips and tricks in Destiny 2 Boss Guide: Defeating Acanthos the Gate Lord. Acanthos the Gate Lord is somewhat a boss you need to defeat in order to proceed to where the Cayde-6 unit is located. Acanthos can be found in the Glade of Echoes between the skirmish fight of the Vex and the Fallen. Both parties are shooting at one another and you will have the time to focus on the Gate Lord himself. Try to be wary though as getting in between the fights might get you in a sticky situation where both forces will focus on you. The Gate Lord will be focused on killing the Fallen troops but once you shoot it, it will look for you and will shoot you in return. You can fight the Gate Lord from a distance by slowly whittling away its hitpoints. Although this might take some time and you might get targeted by other troops from both forces as well. A lot of scattered troops will be in your way so its best to eliminate the troops that are beside you and clean the area where you will position yourself to shoot the Gate Lord. The Gate Lord is very big so it is very easy to shoot from a distance and it moves slow as well. It doesn’t dodge your attacks so you can be sure enough that just focusing it from a distance will kill it… Eventually. It fires off purple waves but it can be easily dodged if you are agile enough. 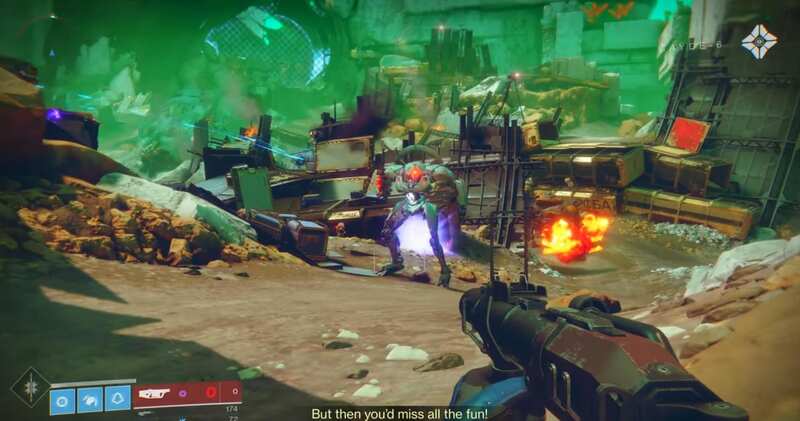 It gets distracted very easily as the Fallen are also shooting from it so you can try to focus on the Gate Lord once he faces the other Fallen. You can also have the option to go Super and then fight it at close range. Just be mindful to not get the attention of all the other troops as you will get killed if you get reckless despite you using your Super ability. Once you successfully finish of the Gate Lord, you can now proceed to the area where the Cayde-6 unit awaits your backup.